Smithsonian Secretaries’ Personal Papers. All of the Secretaries’ personal papers are frequently used special collections. Researchers can conduct focused searches on records from the Smithsonian Secretaries in the Archives' Collection Search. C.D. Walcott was a major player in government-funded scientific research during the first two decades of the 20th century, and oversaw a period of tremendous growth and change at the Smithsonian. He was also a very important invertebrate paleontologist and the discoverer of the Burgess Shale biota. Abbot’s papers not only document his research in solar studies, but include many official records of the Smithsonian Astrophysical Observatory. The collection also contains many early photographs relating to the observatory. Wetmore and Ripley are two of the most important ornithologists in the twentieth century and researchers interested in the history of that field will consult the collections. As is the case with many manuscript collections at the Smithsonian Archives, there is a fine line between "official" and "personal," so these collections all have records documenting Smithsonian history and policy, as well as materials concerning the Secretaries' research careers. Record Unit 7308, American Ornithologists' Union (AOU), Biographical Files, 1883–present. This is collected biographical information solicited by the American Ornithologists’ Union on its members. We also have the records of the union (Record Unit 7150). Record Unit 7098, Biographical File. This collection contains biographies of individuals associated with the Smithsonian as administrative officers, curators, collectors, donors, regents, or research associates. The biographical file, accessible by personal name, consists primarily of news clippings, photographs, press releases, and obituaries. Biographical subjects include Howard I. Chapelle, maritime and naval historian; Joseph Henry, scientist and first Secretary of the Smithsonian Institution; and Thomas William Smillie, first photographer at the Smithsonian. This finding aid is periodically updated. Record Unit 7073, William Healey Dall Papers, c. 1839–1858, 1862–1927. 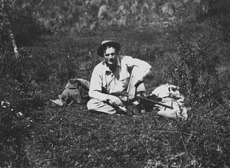 Considered the "dean" of Alaskan explorations, these papers provide comprehensive documentation of Dall's personal and scientific activities from 1865 to 1927, including diaries, scrapbooks, field notes, financial accounts, specimen collection notebooks, photographs, maps, and incoming and outgoing correspondence. Record Unit 7281, William F. Foshag Collection, 1923–1965. This collection includes materials relating to the Parícutin Volcano in Mexico. Record Unit 7179, Edmund Heller Papers, circa 1898–1918. This collection contains materials concerning the Theodore Roosevelt-Smithsonian African Expedition, 1909–1910, and the Rainey-African Expedition, 1912. Record Unit 7449, Joseph H. Hirshhorn Papers, circa 1926–1982. This collection includes correspondence between Joseph H. Hirshhorn, founding donor of the Hirshhorn Museum, and many famous artists. Record Unit 7084, William Henry Holmes Papers, c. 1926–1982. Holmes is an important figure in Smithsonian history. An anthropologist and artist, Holmes served as head curator, Department of Anthropology, US National Museum, and, later, as director of the National Gallery of Art (now the Smithsonian American Art Museum, SAAM). The Archives has a small collection of Holmes Papers. The majority of his papers are housed in the SAAM library in a collection called "Random Records of a Lifetime." The Smithsonian Archives has a microfilm copy of "Random Records." There is also considerable Holmes material at the Smithsonian National Anthropological Archives. Record Unit 7172, Hartley H.T. Jackson Papers, circa 1883–1976. This collection includes many photographs of naturalists and staff of the US Biological Survey. Record Unit 7177, George P. Merrill Collection, circa 1800–1930. This Record Unit includes numerous photographs of 19th and early 20th century scientists. Record Unit 7058, National Institute, Records, 1839–1863.The National Institute was an early scientific institution in Washington, DC and precursor of the Smithsonian. The National Institute collections were transferred to the Smithsonian in 1858 to form the nucleus of the "museum." Record Unit 7081, William J. Rhees Collection, circa 1878–1907. Rhees was the first chief clerk of the Smithsonian and first archivist of the Institution. He served at the Smithsonian from 1852 until his death in 1907. This collection consists of a variety of materials documenting Smithsonian history which Rhees assembled from various means. Record Unit 7091, Science Service, Records, 1902–1965. Science Service was a news service designed to popularize science and to disseminate scientific knowledge. The Archives' Science Service collection is very large and split between this Record Unit and a few accessions. Informational "morgue" files were organized according to the Library of Congress classification scheme. A few of these files are in RU 7091 (see Series 7); more extensive collections are located in Archives Accessions 01-122, 01-243, 90-068, 90-105, and 93-019 and in curatorial collections in Smithsonian Institution museums. A major portion of the biographical "morgue," contains photographs and information about scientists, engineers, and other public figures, is in Accession 90-105. Record Unit 7176, US Fish and Wildlife Service (USFWS), Field Reports, 1860–1961. This collection consists of reports of USFWS and Bureau of Biological Survey naturalists conducting surveys of flora and fauna throughout the United States. Field notes which relate to these reports are in the National Museum of Natural History, and are described in Record Unit 1070201. Record Unit 7055, Vail Telegraph Collection, 1830–1898, 1912–1917. This collection documents the history of the development of the telegraph and includes correspondence of Samuel F. B. Morse, Alfred Vail, Amos Kendall and others important to the story. Information File. This is a collection of assorted materials documenting and relating to the Smithsonian Institution. Arranged alphabetically, the collection includes exhibit catalogs, museum programs, brochures, news clippings, and copies of legislation pertaining to the creation and development of the Institution. Examples of these materials are: models and drawings of The Quadrangle, A Center for African, Near Eastern and Asian Cultures; guidebooks to the National Museums; and Sybil E. Hamlet's manuscript, The National Zoological Park: From Its Beginnings to 1973. Record Unit 96, News Clippings File, 1852–1971. These records consist of news clippings and magazine articles concerning persons and events in Smithsonian history. The clippings were collected between 1852 and 1968. Record Unit 92, Prints and Drawings, 1840. This is a collection of original drawings and reproductions documenting over thirty architectural structures, primarily Smithsonian buildings. The collection documents the work of the architects who helped develop not only the Smithsonian Institution's buildings and grounds, but also Washington landmarks such as the Washington Monument and Rock Creek Park. Noted architects and firms represented include Henry Bacon, Hornblower and Marshall, and James Renwick. Visit the Archives to use the in-house database, the Architectural Drawings Database System, to perform a variety of searches. Research File. This is a collection of files for quick reference to frequently asked questions about the Smithsonian Institution, and research supported by the Institution, Smithsonian staff, and benefactors. Among the files maintained are materials relating to the National Air and Space Museum's Enola Gay exhibit; names of the members of the Smithsonian Institution's Board of Regents; and the Smithsonian Institution Peace Corps Program to provide assistance to developing countries undergoing natural and environmental issues. Smithsonian Oral History Collection and Smithsonian Videohistory Collection. Researchers can conduct focused searches for oral and video histories in the Archives' Collection Search. Since 1973, the Archives’ Oral History Program has conducted interviews with current and retired Smithsonian staff, and others who have made significant contributions to the Institution. The purpose of the program is to supplement the written documentation of the Archives’ records and manuscript collections, focusing on the history of the Institution, research by its scholars, and contributions of its staff. The interviews document the careers of Smithsonian administrators, scholars, craftsmen and craftswomen, guards, and technical staff, as well as volunteers and research associates. The Smithsonian Videohistory Program, funded by the Alfred P. Sloan Foundation from 1986 until 1992, used video in its historical research. The experimental program recorded projects that reflected the Institution's concern in the fields of contemporary science and technology. Projects covered topics in the physical and biological sciences as well as in technological design and manufacture.